Are you a UN Postgraduate Research student, registered on one of our research degree programmes? 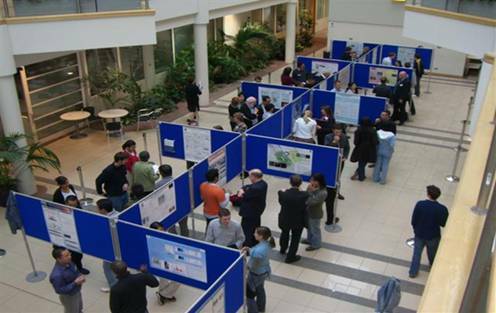 If so, you may be interested to know that The Graduate School are holding their 11th Annual Poster Competition on Wednesday 18th May 2016, so why not take part? We are offering a first prize of £100, and two second prizes of £75 and it’s an excellent opportunity for you to illustrate and discuss your research. The competition will be held in the Dialogue Cafe in Rockingham Library. If you are interested you have until Wednesday 20th April 2016 to return the entry form, which secures your place in the competition. Please note that you have until the 18th May to produce and print your final poster, as you will be required to hang it yourself in the Dialogue Cafe on the 18th May at 10am. The competition has its own Rules of Entry, to which students must adhere in order to be in with a chance of winning a prize so if you are thinking of entering please read this first. If you would like help with the design and content of your poster then why not book onto the 2-hr training workshop on 12th April at 12:30-2:30pm in the TPod, Rockingham Library, Park Campus? To sign up to this please see the Eventbrite booking page. If you have any queries about the competition or workshop please contact Simone Apel. Posted on February 24, 2016, in Competitions and awards, Events. Bookmark the permalink. 1 Comment.